A general pupose foil faced PIR insulation board offering enhanced thermal performance. Can be used for floors, roofs and walls. 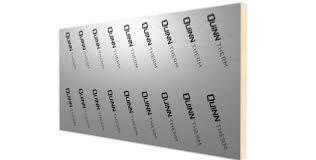 A high performance, fibre free board, with a rigid thermoset insulation core faced on both sides with a low emissivity composite foil facing. These low emissivity facings increases its thermal resistance of unventilated air space adjacent to the insulation. Suitable for new build and refurbishments projects in both domestic and commercial build.